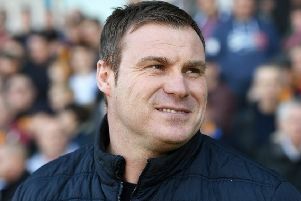 Mansfield Town finally achieved back-to-back League Two wins for the first time all season as CJ Hamilton's 41st minute strike secured a hard-earned 1-0 home win over Port Vale today. That made it 14 games unbeaten for the Stags as they shut out a Vale side that ended with 10 men after Manny Oyeleke was sent off for a second bookable offence on 64 minutes. Stags were not at their silky best against a dogged Vale side that refused to roll over, but Mansfield defended so well that keeper Bobby Olejnik did not have a real save to make all afternoon. The win kept Stags in the play-off places. Mansfield reverted to the XI that took on Charlton Athletic in the FA Cup last Sunday, reversing the 10 midweek changes for the Checkatrade Trophy clash with Scunthorpe United. As last weekend, they started with a 3-4-3 formation. Stags had a long Legge throw to deal with in the opening minutes and Conlon pulled a 20-yard shot wide as Vale began the game on the attack. Pope then went down very easily as he and White stood together as the ball came in, but the referee was having none of it. It took Mansfield 15 minutes to fashion a chance as Mellis pulled a low shot into the near sidenetting from the edge of the box. A minute later Hamilton got into the box on the right and made space for a low shot across the keeper that struck the base of the far post. Conlon was booked for bringing down White on 21 minutes. And 10 minutes later Oyeleke was added for a similar offence as he pulled down Walker when he threatened to break away. On 35 minutes Pearce had his own keeper stretching upwards after he had sliced the ball when cutting out a Whitfield cross from the right and it threatened to loop over Olejnik. But a poor half sprang to life four minutes from the break when Hamilton opened the scoring. Slipped into the box by White's pass on the right of the box, Hamilton smashed a superb left-footed finish across keeper Brown and inside the far post. Walker almost doubled the lead three minutes after the break. Davies drilled in a low cross from the right by-line and right in front of goal, Walker saw Brown get in the way of his cheeky backheeled attempt at finishing. Rose replaced Davies in the home attack on 54 minutes. A quickly taken free kick saw Mellis send White to the right by-line, but no one was able to turn it home, then Brown took the ball off Hamilton's toe before he could capitalise on Walker's through ball as Stags stepped up their hunt for a second goal. Another excellent low cross from White was flicked into the sidenetting by Benning on 62 minutes. Vale were reduced to 10 men when Oyeleke's foul prevented Bishop bursting into the box and, having already been booked, he was shown red for a second yellow card offence. Hamilton's pace was too much for Dodds on 69 minutes as he was added the book for bringing him down and tempers began to rise a minute later when Montano hacked down Mellis for another caution. Sweeney was withdrawn on 77 minutes, Elsnik coming on as Stags reverted to a 4-4-2 to halt a spell of Vale pressure. It should have been all over on 82 minutes when keepr Brown slipped and gave the ball to Rose in front of goal, but he managed to desperately block the striker's finish and Walker blazed the follow-up over the bar. Pope was added to the book for a flare-up in the centre circle on 86 minutes just before Graham replaced Walker up front. Hannant was the next in the book on 87 minutes for yet another foul, Bishop joining him a minute later as the first Stags yellow of the game, also for a foul. In five added minutes Rose forced Brown into a fine save to his right when the home side suddenly found themselves two on two. MANSFIELD: Olejnik; Sweeney (Elsnik 77), Pearce, Preston; White, Mellis, Bishop, Benning; Walker, Davies (Rose 54), Hamilton. Subs not used: Logan, Atkinson, Butcher, Graham, Smith. PORT VALE: Brown, Joyce, Legge, Oyeleke, Pope, Hannant, Rawlinson, Smith, Conlon (Dodds 55), Clark, Whitfield (Montano 55). Subs not used: Horby, Kay, Quigley, Vassell, Hardcastle.